App developer Steven Troughton-Smith posted a number of images on Twitter of what appears to be Apple's upcoming iOS in the Car interface. The files may have been bundled into the recently released iOS 7.1 beta 4, but it is unclear how Troughton-Smith was able to obtain the images, which show a simple iOS 7-style Maps design. When asked for clarification on the origin of the images, Troughton-Smith declined to comment. First introduced alongside iOS 7, the upcoming iOS in the Car feature is designed to provide enhanced iOS integration in automobiles, offering an iOS-style interface on the car's touchscreen dash that allows users to make phone calls, access Maps, control music, and more. 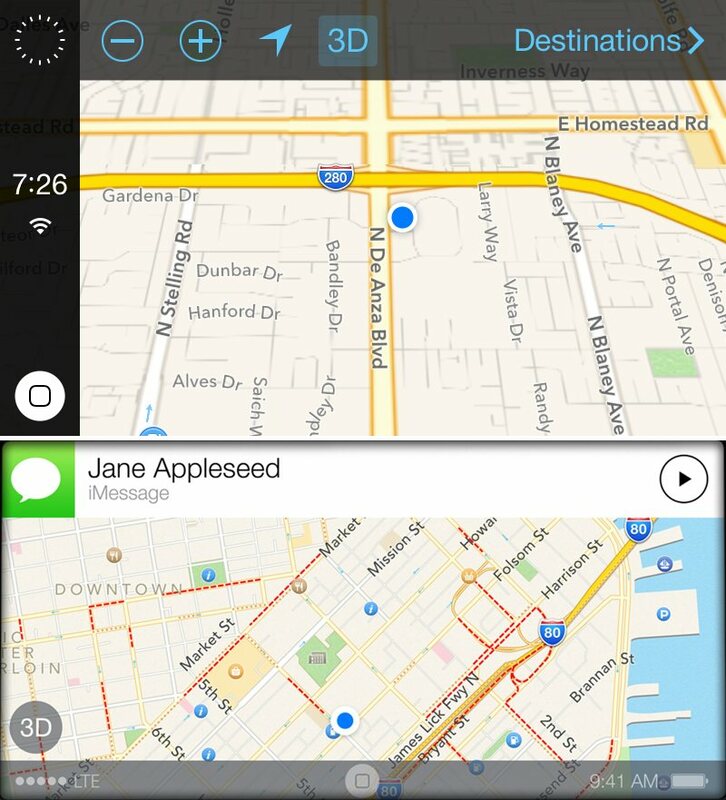 As shown in the screenshots, the software includes a warning screen like most typical GPS software, and it also has a home screen and an area for bookmarks. The images of iOS in the Car provided by Troughton-Smith are quite different from those that have been provided by Apple in marketing materials, but that could be due to an evolution of the software's development. In the image below, Troughton-Smith's screenshot is compared to Apple's early example of iOS in the Car. On Apple's iOS 7 website, iOS in the Car is listed as "Coming soon" and the company has given few hints as to when it might make an appearance in cars. 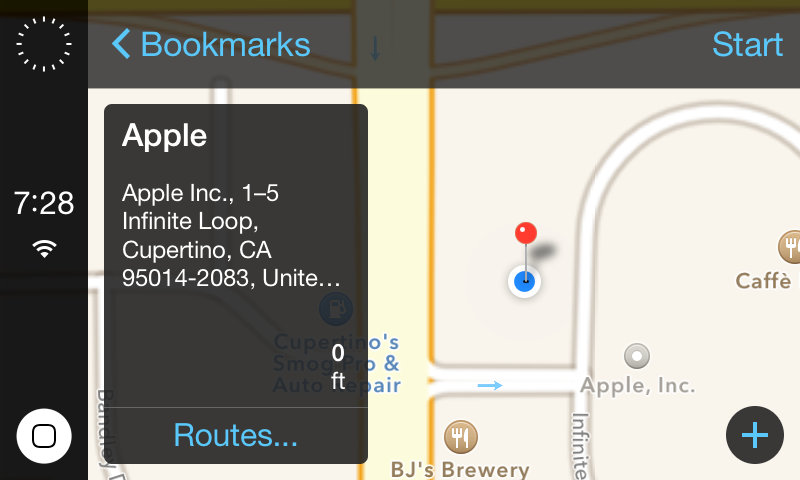 In mid–2013, Tim Cook said that iOS in the Car was an "important part of the [Apple] ecosystem" and a "key focus." Many car makers have expressed interest in including iOS in the Car in their 2014 models, including Audi, BMW, Acura, Chevrolet, Honda, and more. While Honda has included new HondaLink connectivity in its newly released models and several car manufacturers have implemented support for last year’s Siri Eyes Free, cars with full support for iOS in the Car have yet to be released. Specific iOS in the Car settings were found in the second iOS 7.1 beta, leading some to believe that iOS in the Car support could be a feature bundled into iOS 7.1. Currently on its fourth beta iteration, it is unknown when iOS 7.1 will be released to the public. I can't wait for people to play Angry Birds Go while driving. Especially since the controls are accelerometer-based. And I JUST paid off my car. That's what the AppRadio 3 allows. Turns my iPhone 5 into a 7" touchscreen in my dash. Just put an iPad mount in the car. I don't need embedded toys that are outdated in a couple of years. Having mobile phone functionality in a car sounds like a bad idea to me. We need to be focusing on the road. Been waiting for this with my AppRadio 3. Where am I going to put an aftermarket stereo in my Mercedes? Yep I'm holding off buying a tv also. Your point is? ?